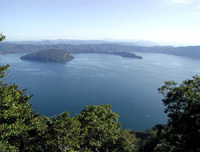 Lake Towada is Japan's third deepest lake (326m) and lies 400m above sea level. The volcanic crater it occupies is 44km in circumference and its rim reach up to 1000m. 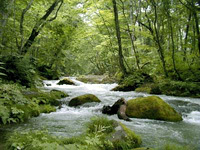 It is located at the boundary of Aomori and Akita prefectures, in the Towada-Hachimantai National Park, and is one of Tohoku's most popular attraction. Almost 3 million people visit the area every year. The three main tourist centers around the lake are Yasumiya, Utarube and Nenoguchi. There are various youth hostels, minshuku and camp grounds around, as well boat tours on the lake. 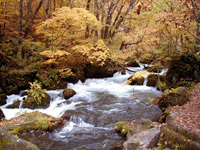 All visit to the Lake Towada area shouldn't be complete without hiking up or down the Oirase-gawa Valley, between Nenoguchi and Ishigedo. The valley is made of fresh, mossy green forest, small boulder-crashing waterfalls. The high-season is in autumn, with its resplendent red and yellow foliage, but the lush greenery of spring and summer rank high too. The hike is about 5km on the map and takes about three and a half hour the way up to Ishigedo. The JR Bus Tōhoku leave Aomori station for Lake Towada (￥3000) regularily in the morning and early afternoon from April to early November. 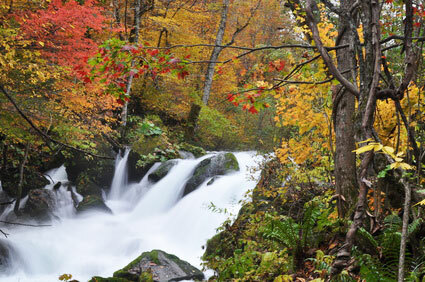 They also stop at Oirase-keiryu Onsen, Towadako Onsenkyo, Yakeyama, Ishigedo, Nenoguchi and Utarube. Buses to Towada-ko cost ￥2,600 from Hachinohe or ￥2,420 from Morioka. Note that only some of the JR Bus Tōhoku can be used with the Japan Railpass (eg. 2pm from Morioka and 9am to Morioka). For a complete timetable visit the JR Bus Tohoku's official site.